The Makeup Examiner: What's The Latest Natural Anti-Aging Game Changer? What's The Latest Natural Anti-Aging Game Changer? Looking for a game-changing, natural solution to stop wrinkles and saggy skin around the eyes … right in its tracks? 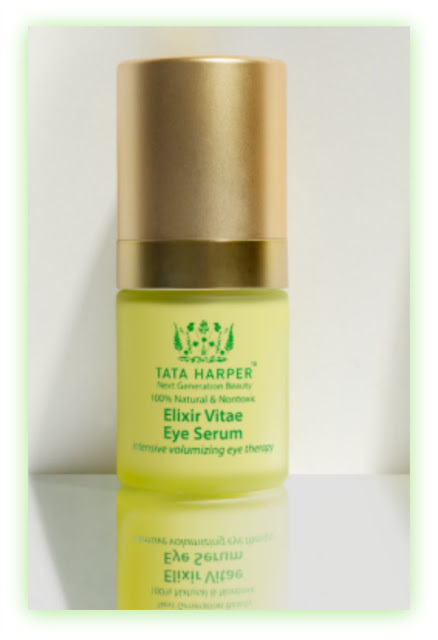 Enter Tata Harper’s New Elixir Vitae Eye Serum. The latest addition to her fan-favorite, Elixir Vitae, this new launch instantly plumps, lifts and tightens the eye area, while visibly repairing existing lines and preventing the formation of new ones and helping to achieve a youthful complexion. Tata Harper Elixir Vitae Eye Serum Intensive Volumizing Eye Therapy ($265): Instantly plump, lift, and tighten the eye area with this silky, fast-absorbing anti-aging daily eye serum. Powerful natural extracts visibly repair existing lines in the eye area and prevent the formation of new ones, while boosting the appearance of the skin's youthful cushion to help reverse the hollowing effects of aging. Long-term results include a restored fullness around the eye area, plus increased resilience and a dramatic reduction in the visibility of lines and wrinkles. Tata Harper Elixir Vitae Eye Serum Intensive Volumizing Eye Therapy is available online at Tata Harper and in stores at Neiman Marcus.